Clashes have erupted between Kurds and security forces in Turkey to protest a decision by the country's top court to shut down a pro-Kurdish political party on charges of ties to militants. Around 1,000 Kurds clashed with security forces in the city of Hakkari in Turkey's predominantly Kurdish southeast. The clashes erupted after police broke up a demonstration protesting the closure of the pro Kurdish Democratic Society Party, or DTP. Similar protests are reported in other towns and city's in the region. On Friday night in Diyarbakir, the main city in the predominantly Kurdish region, crowds chanted "We will go to the mountainous to fight with the PKK", after police broke up their protest. The PKK have been fighting the Turkish state for greater Kurdish rights for 25 years. Turkey's constitutional court on Friday found the DTP guilty of having links with the PKK and threatening the integrity of the Turkish state. 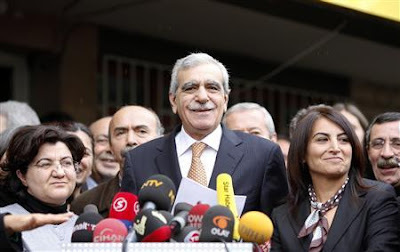 The top court banned their party and two of its leaders, including Democratic Society Party chairman Ahmet Turk, for links to Kurdish separatist rebels. On Saturday, the DTP said all of its remaining 19 lawmakers withdrew from parliament and will not attend parliamentary sessions. Addressing the media on Saturday, Turk made the announcement: From this day, we are withdrawing from parliament. We will not participate in any parliamentary meeting or events, he said. Turk went on to say that the court's decision was a political not a lawful. He said his party was committed to peace. Turk also blamed the ruling party, the Justice and Development Party, or AKP, for staying silent as his party was being stripped of power. Turkish president Abdullah Gul supported the court's decision but expressed regret that the country's party leaders had not found better ways to protect political parties. The court decision comes as Turkey seeks to join the European Union. On Friday, the EU's Swedish presidency issued a statement expressing concern over the ruling. It said while the EU strongly denounces violence and terrorism, the dissolution of political parties "is an exceptional measure that should be used with utmost restraint." A U.S. State Department spokesman called the ruling Turkey's internal matter, but added that the country should continue to advance political freedoms for all its citizens. The spokesman said measures that "limit or restrain these freedoms should be exercised with extreme caution."